This vegetarian heart healthy wheatberry and lentil salad is great in the winter months. Double the serving size and you have a main course vegetarian entree. 1. In a small sauce pan, cover wheat berries with 1.5 – 2 inches (4-5 cm) of water. Bring to a boil, reduce heat to medium low and simmer uncovered for 45 minutes. Drain and cool. 2. To make the dressing: in a small bowl whisk together oil, vinegar, honey, salt and pepper. 3. 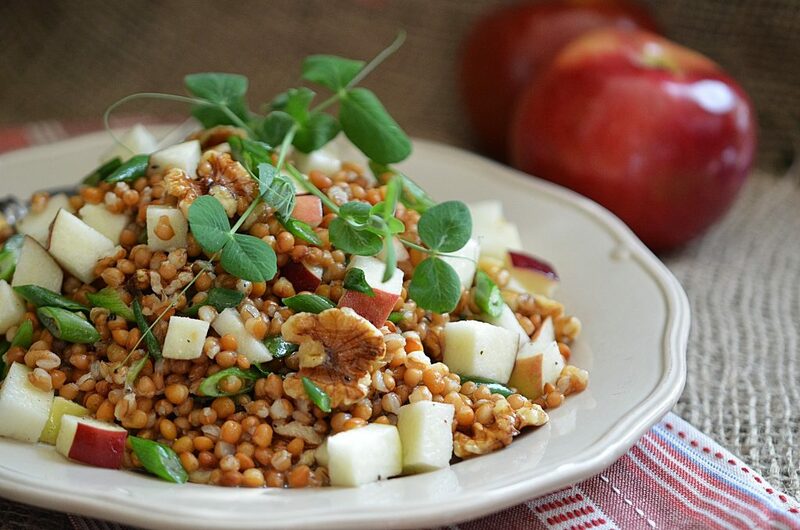 To make the salad: In a large bowl toss together the wheatberries, lentils, walnuts, green onion, and apple. Pour dressing over top and toss well. Serve. Wheatberries are the entire kernel of wheat. Chewy with a mild nutty flavour they can be used instead of cooked rice in salads or stir fries. 1. To toast the walnuts: Preheat oven to 350°F (180°C). Spread out on a on a baking sheet and roast for 5 minutes. Remove from oven and let cool, chop and set aside. Please where can I purchace the book Homegrown?. It is not on Indigo we side. Hopefully I cut and pasted this correctly! I made this yesterday for supper. It was truly delicious and very satisfying. I had the small leftover portion for lunch today. I will definitely be making this again and again. Thank you for this great recipe Mairlyn.